Hummingbird Neon SculptureI dont have a picture of the sign I purchased. I got it as a gift from some friends that own a new Mexican Restaurant in town. It is the best looking neon sign (quality and all) that they have up in their front window. 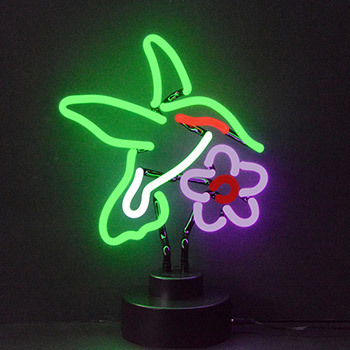 A great way to express your love for the noble game of pool, the Hummingbird Neon Sculpture brings a cool and mesmerizing vibe to your home decor. Perfect for your living room, game room or den, this wonderful free-standing neon sign is sure to add character to your living space. This fluorescent sculpture features skillfully hand blown neon tubing, a silent and efficient solid state transformer, and an on and off switch for convenience. A captivating piece of neon art, it comes fully assembled; no wiring required. Made of glass, metal, plastic and electronic components. Assembly level/degree of difficulty: No Assembly Required.